Resistant starch: miracle cure for everything from diabetes to gut dysbiosis, or the #1 way to actually make the problem worse? Well, neither and both. How much resistant starch is best for you (and in what form) really depends on your personal tolerance and gut health. It has some interesting potential benefits, but the research is still new and fairly preliminary – and it also has some significant potential downsides. So here’s a guide to navigating it all and hopefully figuring out how much (if any) resistant starch you might benefit from adding to your diet. What Is Resistant Starch and Where Does it Come From? Resistant starch is a type of fiber. You can’t digest it, but your gut flora can. That’s why it’s called “resistant:” it resists breakdown in the stomach and small intestine, and makes it through to the large intestine intact. Once it’s in the large intestine, resistant starch acts as food for your gut flora. The gut flora ferment it into short-chain fatty acids. Type 2: resistant starch that naturally occurs in raw foods. Sources include raw potatoes and green bananas. Type 3: resistant starch formed in foods after cooking and cooling. Sources include potatoes that have been cooked and then cooled. Quantifying the exact amount of resistant starch in different foods is tricky, because there’s no single method that everyone agrees on. Different papers all give different amounts of resistant starch for various foods. Food labels may or may not tell you anything about resistant starch – in the United States, the resistant starch content of a food is part of the total number for “dietary fiber,” but in the UK it isn’t. 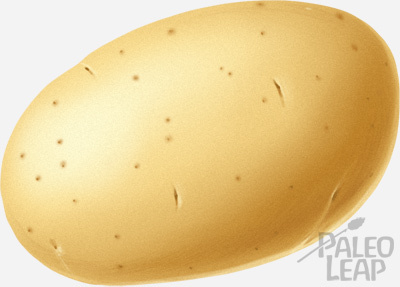 You can also buy several different types of resistant starch supplements, most famously raw unmodified potato starch. You’ll notice something about these starch sources, though: they’re not exactly the most common dietary staples around. 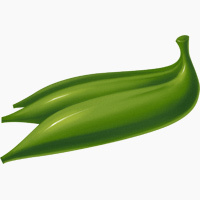 Green bananas? Raw potato starch? The only thing on this list that most people would eat as part of a normal diet is cooked and cooled potatoes (e.g. in potato salad). So why would you want to start mainlining raw potato starch, again? Resistant starch intake seems to decrease postprandial glycemic and insulinemic responses, lower plasma cholesterol and triglyceride concentrations, improve whole body insulin sensitivity, increase satiety, and reduce fat storage. These properties make RS an attractive dietary target for the prevention of diseases associated with dyslipidemia and insulin resistance as well as the development of weight loss diets and dietary therapies for the treatment of Type 2 diabetes and coronary heart disease. The obvious link between resistant starch and gut health is the gut flora. On top of providing food for the bacteria, there’s also some evidence that resistant starch can make probiotics more effective, by protecting the bacteria while they travel to your gut. Resistant starch is also fermented to short-chain fatty acids in the colon, and these fats are a primary source of fuel for cells in your colon. In theory, giving those cells more fuel keeps them healthier, reduces the risk of developing colon cancer, and improve gut health in other ways. This seems logical enough, but the evidence isn’t actually watertight. For example, resistant starch doesn’t increase production of short-chain fatty acids in every study. Also, many of the studies directly connecting it to specific diseases are (a) observational, (b) very small, or (c) conducted on rodents rather than humans. That’s great for preliminary research, but doesn’t definitively prove anything about the effects of deliberately adding RS to the diet of humans. For example, most studies that “prove” a beneficial effect of fiber on the risk of getting colon cancer are really just showing association – they simply show that people who eat more fiber tend to get less colon cancer. But fiber tends to come with fruits and vegetables, and fruits and vegetables supply all kinds of other good stuff: how do you know it was the fiber? Sure, isolated African tribes on a high-fiber diet get fewer gut problems, but fiber is not the only difference between their lifestyle and yours! The short story: it’s plausible and promising, but not proven. Another claim is that RS improves cholesterol levels. Studies in animals have found that RS can indeed lower LDL cholesterol, but studies in humans are conflicting. Some do, and some don’t bear this out. And considering how little we know about cholesterol anyway, who’s to say that lowering LDL per se is necessarily even good? 15 studies have reported an improvement in these measures following the consumption of a RS-rich test-meal, while 10 have showed no, or a physiologically irrelevant effect. Nobody found that resistant starch made anything worse, but the evidence for benefits is mixed at best. RS added to foods does lower the glycemic load, mostly because it’s replacing carbs you can digest. You’d get the same effect by replacing those carbs with protein or fat – it’s essentially just substituting not-carbs for carbs. The only problem with this is that it’s typically used in highly processed low-carb breads and cakes, which don’t have a central place in a Paleo diet anyway. If these foods are adding a significant number of calories to your diet, you’re not eating Paleo in the first place. Another claim about resistant starch is that it helps you burn more fat, rather than carbs, for energy (the implication being that you’ll be burning through your own fat stores, thus losing weight). Unfortunately, the evidence for this is scanty at the very best, and doesn’t point to much benefit. Studies about satiety (feeling full) returned mixed results. Some found that RS didn’t have any effect on satiety; others found that it helped, but only for a short time after the meal. It doesn’t seem to have a long-term effect big enough to modify total caloric intake. There’s some very experimental evidence that RS can do other things – for example, improving calcium absorption, or modulating immune function – but again, we need more research in humans, not just animals and test tubes. Overall, the evidence in the “pro” column is mixed. Is resistant starch a healthy component of whole foods? Probably. Is it a miraculous cure for diabetes and colon cancer? Probably not. And in fact, there may even be significant downsides for people with gut dysbiosis, especially small intestinal bacterial overgrowth (SIBO). In SIBO, bacteria that ought to be in the large intestine spill over into the small intestine as well. These are the bacteria that just love a nice dose of resistant starch – if you give them that food, they’ll grow and multiply just like they would in the large intestine. But that’s exactly the opposite of what you want to happen! Think about it: if you already have a gut flora overgrowth, the absolute last thing you want to do is give your gut flora an all-you-can-eat buffet. That doesn’t make resistant starch bad; it just means it’s not for everyone, and a quick look at the waters is very wise before you jump in with both feet. Ultimately, resistant starch is a very good example of why it’s better not to get too excited over every new “miracle nutrient” that comes along. Yes, it may have some interesting health benefits. If you already have a healthy gut, it might be wonderful – certainly there are plenty of anecdotal reports. But hyping it as the cure to everything that ails us is premature at the very best – the evidence just isn’t there. And in fact, people with bacterial overgrowth problems may want to avoid it altogether, since it could actually make symptoms worse. If you want to know more, or you’d like to try it for yourself, here’s a good primer to start with.